During the period January 18th to March 18th 20198, there will be an exhibition of a selection of images from the Feeding Body and Soul project in the Halton Mill near Lancaster. Halton Mill is owned by the award winning Lancaster Cohousing, a community of 41 Passivhaus eco homes next door to the Mill. Many of the residents, who are committed to sustainable and neighbourly living, work out of the Mill. The mill is a historical industrial building, built in the late 19th century. Until 2008 it housed Luneside Engineering. The building has been eco renovated including a new roof, new windows and insulation. Heating is provided by a biomass boiler and solar thermal. There are solar PV panels on the roof of the Mill and the majority of our electricity is provided by Halton Lune Hydro, a community based hydro scheme which has built a micro hydro turbine on a nearby weir. It started to produce electricity in December 2014 and the building is now running 100 per cent on renewable energy. It has been awarded a top A rating Energy Performance Certificate for the Mill, showing it is at the highest standard of energy efficiency. It is extremely rare for an old building to be awarded an A rating. The internal refurbishment has been done using recycled and enviromentally friendly materials where possible. 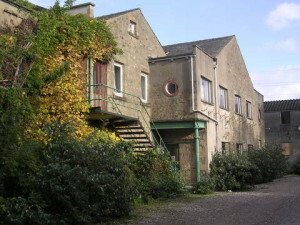 The Lancaster Community Car Club is based at the cohousing development, which Mill tenants can join, and there are car club cars available on site. The vision is to create a vibrant and inspiring environment in which small businesses, social enterprises, community based organisations, craftspeople, artists and freelancers can flourish. To do this with regard to the environmental impact of our business activities and to share resources and facilities.